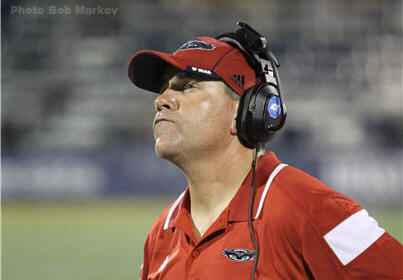 Florida Atlantic Head Football Coach Charlie Partridge held his weekly press conference on Monday morning, and discussed the Owls' upcoming contest against the University of Alabama at Birmingham. Below are some of the notable pieces of information he discussed. “UAB is a team that took, what is arguably the No. 1 team in the country, they gave them everything they have and it was a pretty good game, when they played Mississippi State earlier in the year. They played Arkansas Saturday, and…certainly got word of how much emotion they brought to the beginning of that game. It got a little bit out of hand in the first half, but they won the second half 17-10 when Arkansas felt comfortable, so, a lot of respect coming from the Arkansas staff towards UAB. Defensively, they are a 30-front team, which presents challenges. Just in terms of we will have to spend time on what they do schematically. They moved their nickel to play safety and he did a really nice job. No 26 (Rolan) Milligan. He jumped off the film. All indications were that Cody Clements could have played their quarterback last week. He was jumping around during warm-ups, throwing the ball and all those kind of things. All indications are that he will be back to play. He got nicked late in the game, the week before that. Tight end, #86, (Tristan Henderson) is a good player, has 26 receptions, but the guy that jumps off the film all over the place is J.J. Nelson, #1. He is one of the top kick returners in the country. He has two touchdowns on the year, one of them last week against Arkansas, one of them earlier in the year against Western Kentucky. He is dynamic with 1,200 all-purpose yards, made some big plays against Mississippi State. He is a good football player. So, we have got our hands full on all three phases this week and I think Coach (Bill) Clark is doing a nice job with his team." "Disappointed - We played three quarters of really good football. You could argue, we played some darn good defense, with the exception of three or four plays. Offensively, there were times that we moved the ball. Again, we just have got to finish in the red zone. We are taking a hard look at those things. First and six from the six, you would like to be able to run the ball in so we are looking at those things. Fourth and three and that moment, I would go for it again, because at that point our defense was getting three and outs. I think we had three - three and outs in a row, or somewhere in that area. I had confidence in our offense. Yes, I understand we went 6-for-6 the week before. Did it play into it? Probably, a little bit, but more the flow of the game. I would do it again and I have no hesitation about that by the way things were going. At the end of the day, we would have pinned them in there in my mind because of the way we were playing defense. And, that didn’t turn out the way you would hope. So, disappointing but there is a lot of things to build on. (It) shows that we are getting closer. We just need to keep getting better and not allow Marshall to beat us twice." Was the hardest thing falling short in the fourth – Was it not playing four full quarters? "The hardest – It was one of the things that were hard. I think one of the hardest was not finishing when we got down close and three big uncontested runs. Those were the hardest to watch on film. Anyone could see that those were killers. We were very aggressive in what we did and it paid off. You live and die by the sword. I and us need to do a better job of making sure there is overlap so when it breaks through you get them down for 20 and not let it go all the way to the goal line untouched. That is that balance between aggression and getting in there and getting in your gap and still having some overlap in defense and making decisions that way. To answer your question, the combination of those two things was every bit as hard as not finishing the fourth quarter with a winning score in that quarter." "We have talked about it to a degree. One of Coach (Brian) Wright’s main themes for offense is eliminate doubt. And, that is a direct reference to seven wins. In large part because of what this team went through a year ago, when they became bowl eligible and didn’t get picked for a bowl. Indirectly, those goals are being talked about. Every Tuesday, I put up the conference standings, who has won how many games. We do focus on today but, you can’t hide from the big picture either. They are too aware, too much access to everything you want to find. We do talk about it to a degree but it can’t be our focal point. We set that stage after the bye. We are in a four-game season right now until our next bye. We said we need to come out of this four-game stretch with a winning record. That would really set-up some of the things that we want. That is still the case. We are in the third week of the four-week session. We are in that stage and you just have to be careful about changing your theme too much, I think." FAU will kick off against the Blazers on Saturday at 7:00 PM.